President Trump has called the financial regulations passed during the Obama administration a “disaster.” Executive actions signed on Friday order a review of the law. President Trump waits to sign an executive action directing the Treasury secretary to review the Dodd-Frank financial oversight law in the Oval Office on Friday. 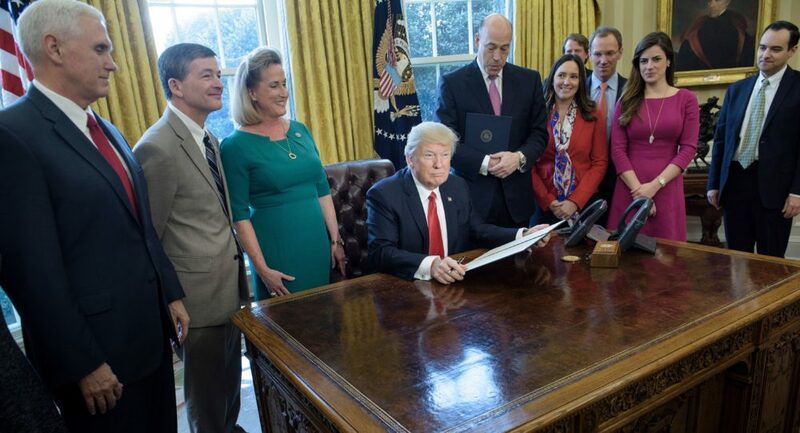 These executive actions are the start of a Trump administration effort to reverse or revise financial regulations put in place by the Obama administration and seen by Trump and his advisers as onerous and ineffective. Based on the description given by the administration official who briefed reporters, the directives the president is expected to sign Friday won’t immediately do a big number on the law. The directive will instruct the Treasury secretary to meet with the agencies that oversee the law to identify possible changes. The president of the nonprofit Wall Street watchdog Better Markets issued a statement blasting Friday’s actions. That is an allusion to the Consumer Financial Protection Bureau, the consumer watchdog bureau which Republicans in Congress opposed from its very creation and was the subject of a years-long fight over its leadership and structure. “This is not an attempt to undo Dodd-Frank,” the administration official insisted before going on to explain that some of the work of changing regulations, including the so-called Volcker Rule to mitigate risks, could be done through personnel, putting Trump-allied people in charge at agencies like the Securities and Exchange Commission. It isn’t clear yet how long the review would take, but the official says every aspect of the law will be considered. A second directive would call on the Department of Labor to defer implementation of an Obama-era rule, known as the Fiduciary Rule, requiring financial advisers to act in the best interests of their clients in retirement planning. The deadline for implementation was supposed to be April. Echoing arguments of the financial services industry, the Trump administration official said the rule would have unintended consequences if allowed to go forward. The industry says the rule will make it harder for advisers to serve lower-income clients. Backers of the rule say it will prevent advisers from gouging customers by selling them inappropriate, high-fee products. Once the review is complete, the official said, it’s possible the Labor Department could determine the rule is completely unnecessary. This rule has been heavily lobbied and some financial industry organizations had been pushing for the Trump administration to delay it. Dodd-Frank, passed in 2010, is made up of many provisions across many different regulatory agencies, some of which — like the Labor Department’s Fiduciary Rule — have yet to be implemented. The intent of the law was to implement comprehensive safeguards to monitor and regulate financial institutions so their potential failures would not pose a risk to the entire economy. The creation of new agencies, including the Financial Stability Oversight Council, made up of 10 regulators representing the Federal Reserve, Treasury Department, the Federal Deposit Insurance Corporation and the Securities and Exchange Commission, among others. It also created the Consumer Financial Protection Bureau, which has broad authority to monitor and investigate financial institutions and enforce consumer rights. The creation of a mechanism to unwind large financial institutions if they run into trouble. The law required all financial institutions designated as “systemically important financial institutions” to prepare so-called “living wills.” These wills would give regulators more transparency into the bank or insurance firm’s activities, in order to better mitigate risk. The limitation of banks’ ability to take risks, in part through a provision known as the Volcker Rule (named after Obama administration economic adviser Paul Volcker), which prohibits banks from making certain types of speculative investments with their own money. The establishment of a structure for regulating a relatively new derivative market known as credit default swaps, which prior to the Dodd-Frank Act were largely unregulated. Major financial institutions traded these swaps, which functioned like insurance on mortgage securities, and as the underlying mortgages started to fail, it created enormous liabilities for firms like AIG. The creation of new standards for mortgages, including provisions requiring loan underwriters to better vet their borrowers’ ability to repay, and increasing consumer disclosure requirements to lenders.